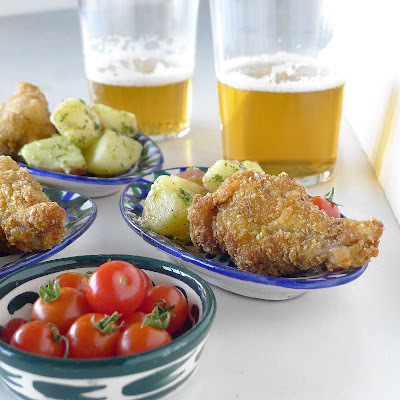 Did you miss World Tapas Day? That was Thursday, but you can still celebrate. Are you inviting folks over to watch the next Spain match in World Cup soccer? Maybe you’re planning a picnic for the Fourth of July? Whatever the occasion—tapas party, picnic at the beach, buffet supper or potluck, the answer is wings! Bring ‘em. Crispy chicken wings with a green chile/cilantro dipping sauce. 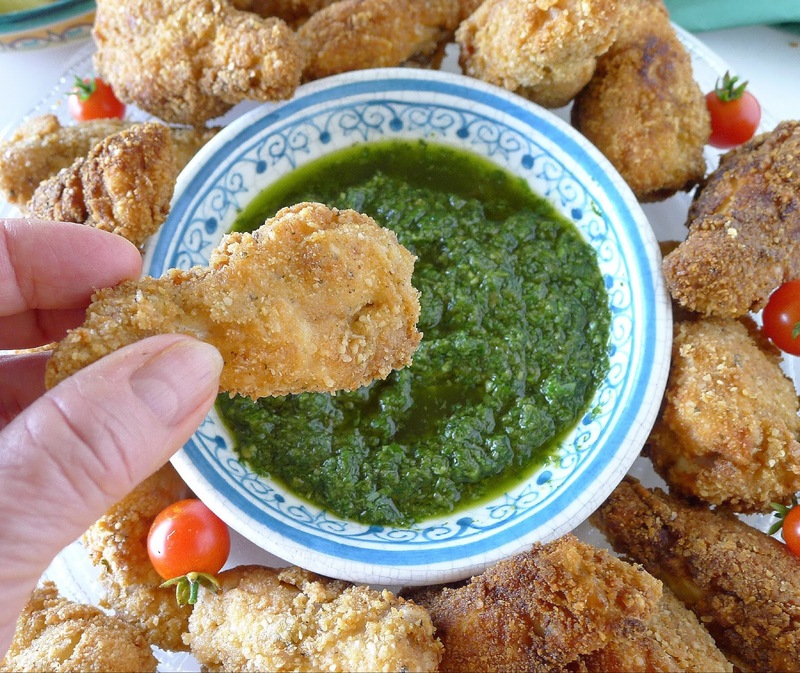 Wing drumettes are breaded and fried in olive oil. 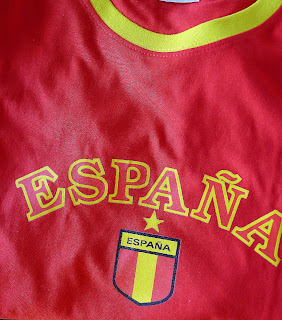 Spain’s last match in first-round play is Monday, June 25, against Morocco. (At 8 pm in Kalingrad, Russia, 8 pm in Spain, and 2 pm ET in the US.) Will the team make it to the final July 15? That will mean a lot more wings! 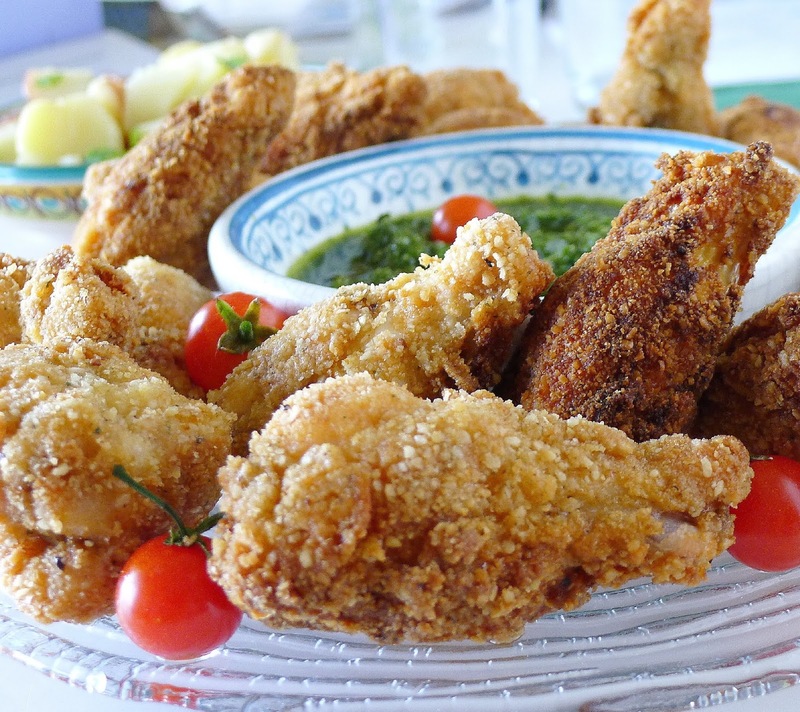 The thick wing joint, also called drumette, is best for breading and frying. If you have to use whole wings, save the flat joints and wing tips for making stock. The wings are seasoned in a quick marinade before being empanadas, breaded, by dipping in flour, beaten egg and bread crumbs. 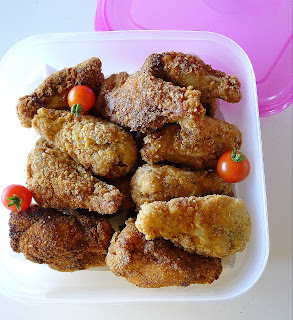 Allow the breaded wings to dry in the fridge for an hour before frying. 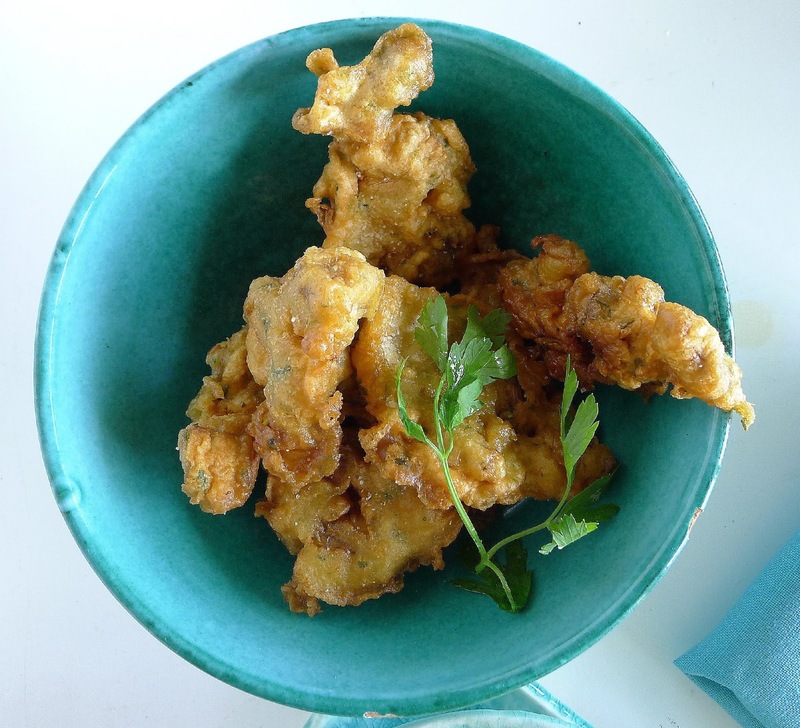 More about frying with olive oil here. 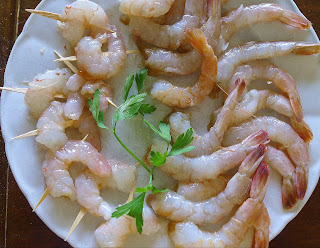 A quick marinade with pimentón and lemon juice gives the wings flavor. 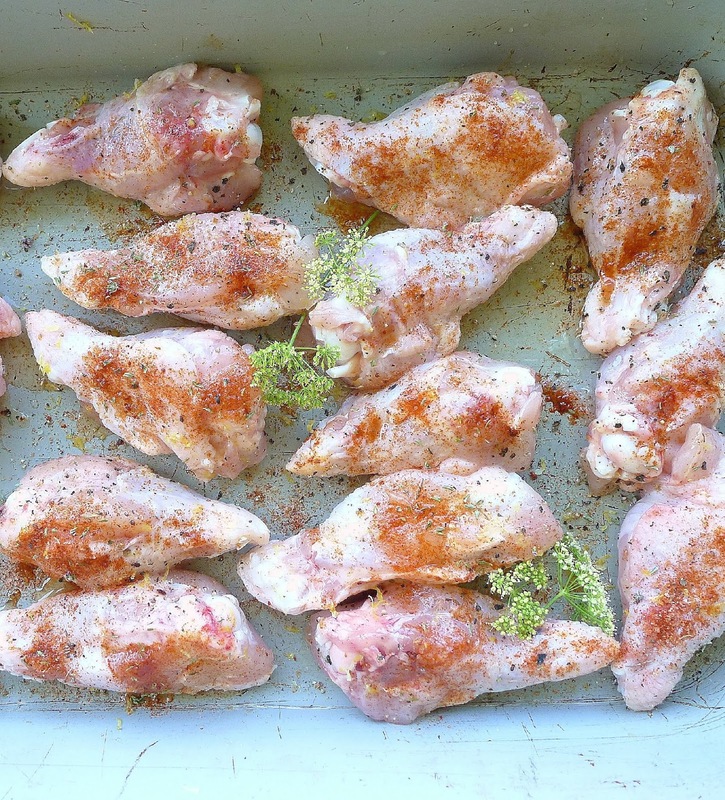 Place the wings in a single layer on a sheet pan. In a small bowl combine 2 teaspoons salt, pepper, two kinds of pimentón, thyme and lemon zest. 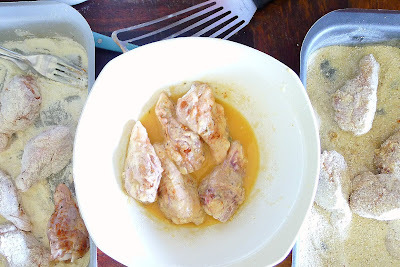 Sprinkle the salt mixture evenly over both sides of the wings. Sprinkle with lemon juice. Let the wings marinate at room temperature for 30 minutes. 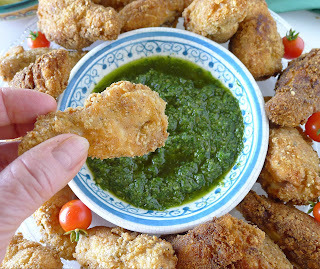 Assembly line for breading the wings: dredge them in flour, dip in beaten egg, then roll them in fine dry bread crumbs. Let them dry for an hour before frying. Beat the egg with the water in a medium bowl. Combine the flour with ½ teaspoon salt and place it in a shallow bowl or pan. Place the bread crumbs in another bowl or pan. Dredge the chicken wings in flour then dip them in beaten egg. Roll them in bread crumbs. Place on a sheet pan and refrigerate, uncovered, for 1 hour. 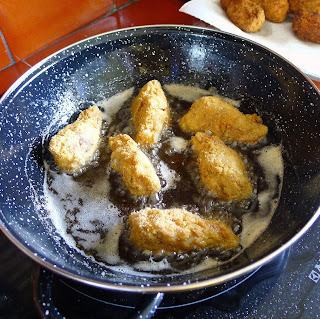 Frying wings in olive oil. Don't let them brown too quickly. They need to cook thoroughly in the 6-8 minutes it takes to brown them on all sides. Place oil in a frying pan to a depth of 1 inch. Heat the oil until it is shimmering, but not smoking (360ºF, if you have a frying thermometer). Add wings in one layer. Fry until golden on one side, about 2 minutes. 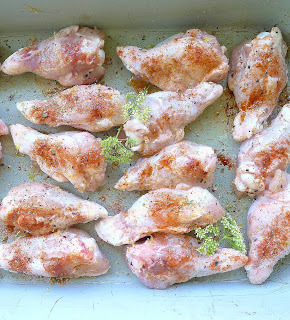 Turn once or twice more until wings are golden-brown on all sides, 6 to 8 minutes total. Moderate the heat so wings don't brown too fast. 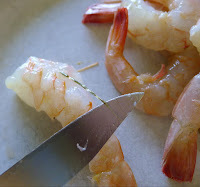 (Remove and cut into one wing to make sure meat is cooked.) Skim the wings out and drain them on paper towels. Continue frying remaining wings. Serve hot, warm or room temperature, accompanied by dipping sauce, if desired. Wings can be reheated in a medium-hot oven for 5 minutes. Once cooled, wings can be packed in plastic containers for carrying to a picnic. 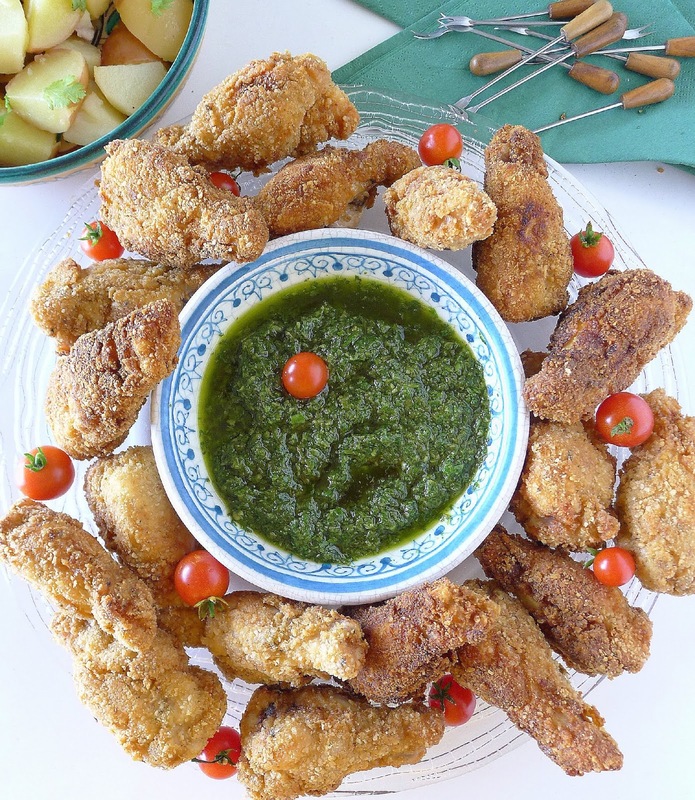 Spicy chile sauce with fresh cilantro goes well with fried foods. 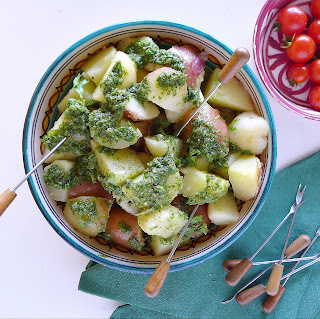 Instant potato salad: spoon the mojo chile sauce over boiled new potatoes. This sauce is typical of the Canary Islands where it is served with potatoes and grilled fish. 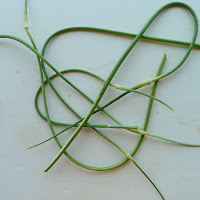 My version this week uses green garlic scapes, the flowering stems of the garlic plant, instead of cloves of garlic. Place all the ingredients in a blender or food processor and blend until smooth. The sauce keeps, covered and refrigerated, one week. Chicken Wings with Garlic (Al Ajillo). Córdoba, capital of the 10th century Moorish caliphate, is known for the dish of salmorejo, a thick tomato-based gazpacho cream. Once a meal for field hands working in the olive groves, wheat fields and vineyards of Andalusia, salmorejo today is served in tapa bars and restaurants with garnishes such as exquisite ibérico ham or chunks of tuna. The origins of salmorejo are Moorish. But, hang on. There weren’t any tomatoes back then. Tomatoes, “discovered” in the New World after Columbus, did not become widely cultivated in Spain until the 18th century. Indeed, the original salmorejo contained no tomatoes. It was probably first a simple gruel made by Roman legionnaires, of bread crushed with olive oil and garlic. The Moors, who introduced almond trees to the Iberian peninsula, added ground almonds to the bread, creating a dish far more appetizing and nourishing. 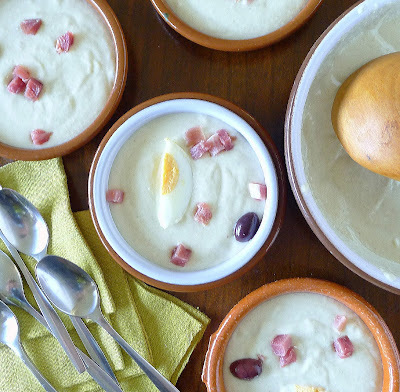 Mazamorra is a savory almond cream, chilled and garnished with ham, egg and olives. Known as mazamorra, this white almond cream is to salmorejo as the white cold soup with almonds, ajo blanco (“white garlic”), is to tomato gazpacho—its precursor. Green almonds, before the fibrous shells have hardened. 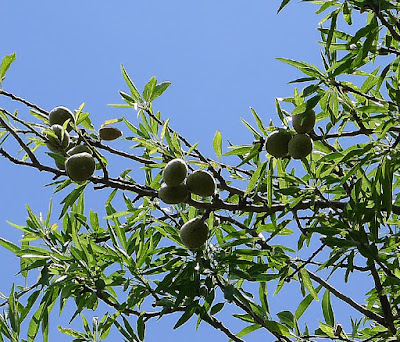 The nut kernel can be used in place of shelled almonds. Mazamorra was originally made in a wooden bowl by pounding the almonds with a mallet or pestle (the maza). Nowadays it is easily confected in a blender or food processor. It can be made with “green” almonds where available. Or, in place of almonds, pine nuts, dried fava beans, carob, lupin beans or vetch. Originally poor folks’ food, mazamorra was made with whatever was available in season. Because it is a Cordoban dish, I recommend that you use extra virgin olive oil from Córdoba. The Picual variety has a fresh, fruity flavor with just a little bite. By the same reasoning, vinegar from the Córdoba wine region of Montilla-Moriles would be the preferred choice, although Sherry or other wine vinegar can be used. 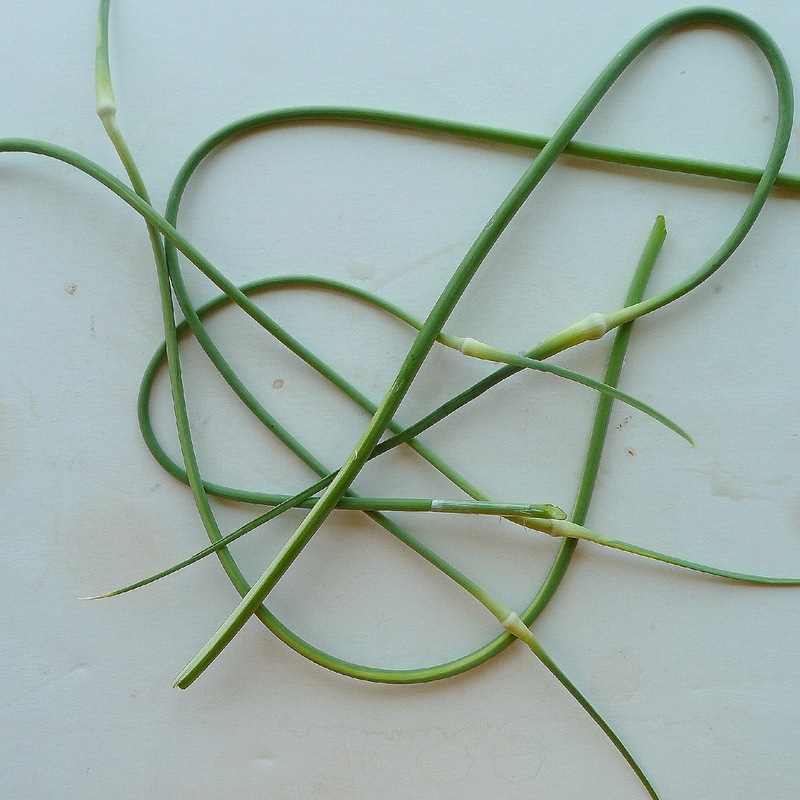 Unlike ajo blanco, which has “garlic” right in its name, mazamorra has a very gentle hint of garlic. The bread should be a dense crumb country loaf. How much water is needed to convert the bread and almonds to a thick cream depends on the bread and the power of your blender. 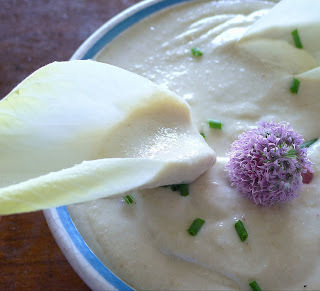 The consistency of the mixture should be a thick cream or stiff mayonnaise. Serve the mazamorra in shallow bowls or ramekins. Variations on the garnish, clockwise from the top, sliced apple, vegetable crisps, and diced ham and melon balls. Serve the almond cream as a party dip with vegetable dippers. 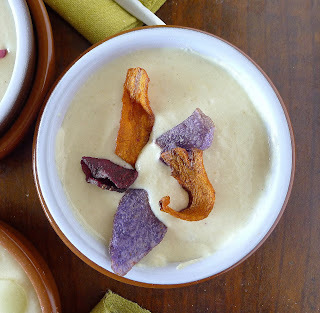 Vegetable crisps (carrot, kale, beet) add crunch to the smooth cream. Use the mazamorra as a sauce or salad dressing. 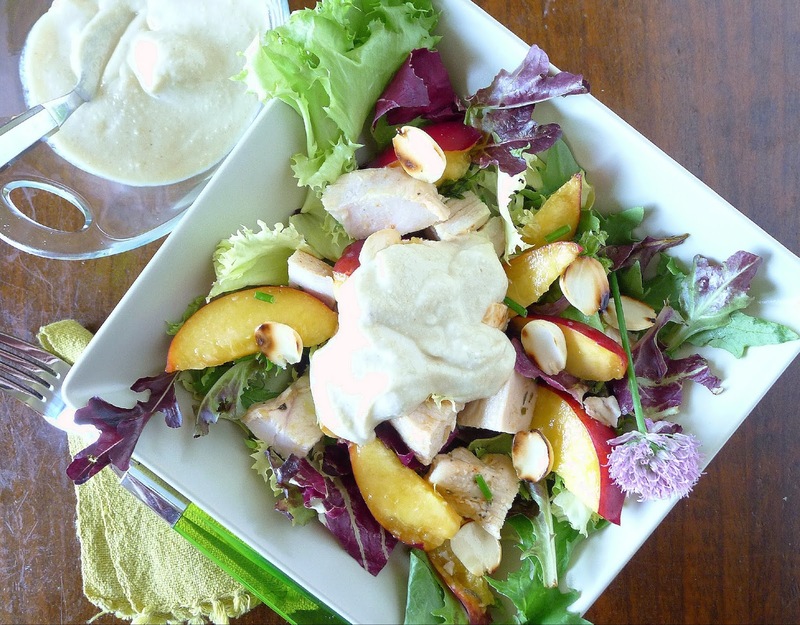 Delicious on this salad of diced chicken, nectarines, toasted almonds, chives and salad greens. 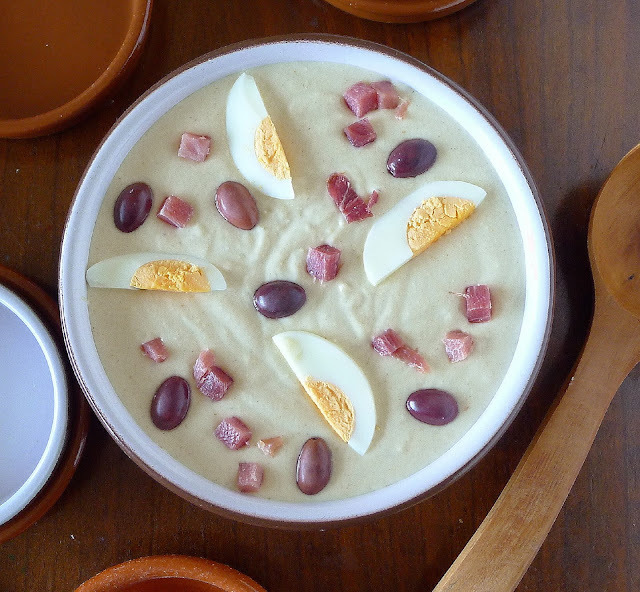 Serve mazamorra very cold as a starter in small bowls garnished with chopped ham, hard-cooked eggs and olives. Like ajo blanco which is served garnished with Málaga muscatel grapes, mazamorra also goes nicely with sweet fruits. Try melon, mango or ripe figs. Or turn it into a dip accompanied by vegetable dippers. Or, use it as a sauce or salad dressing. 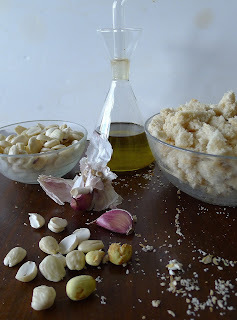 Almonds, garlic, bread and oil. Place the bread crumbs in a bowl and add the water. Stir to moisten the bread and let it set 10 minutes to soften. Add the almonds, garlic, vinegar and salt. Process in a blender or food processor until almonds are ground and the mixture is a thick paste. Blend in the oil. Add additional water, a spoonful at a time, to make a thick cream. Refrigerate the cream. 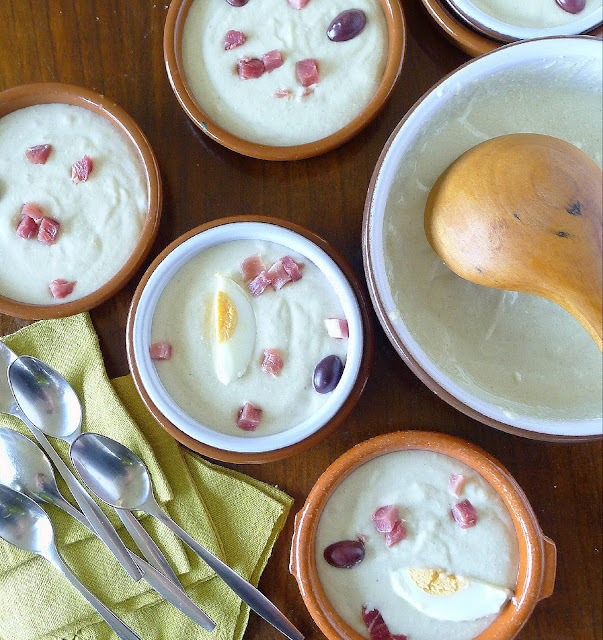 Serve the almond cream in shallow bowls or ramekins garnished with chopped ham, egg and olives. Drizzle with additional olive oil. Two ways to blanch and skin almonds: Soak the shelled almonds in water to cover overnight OR drop them in boiling water for 1 minute. Pinch off the brown skins leaving the white almonds. Green almonds in June. 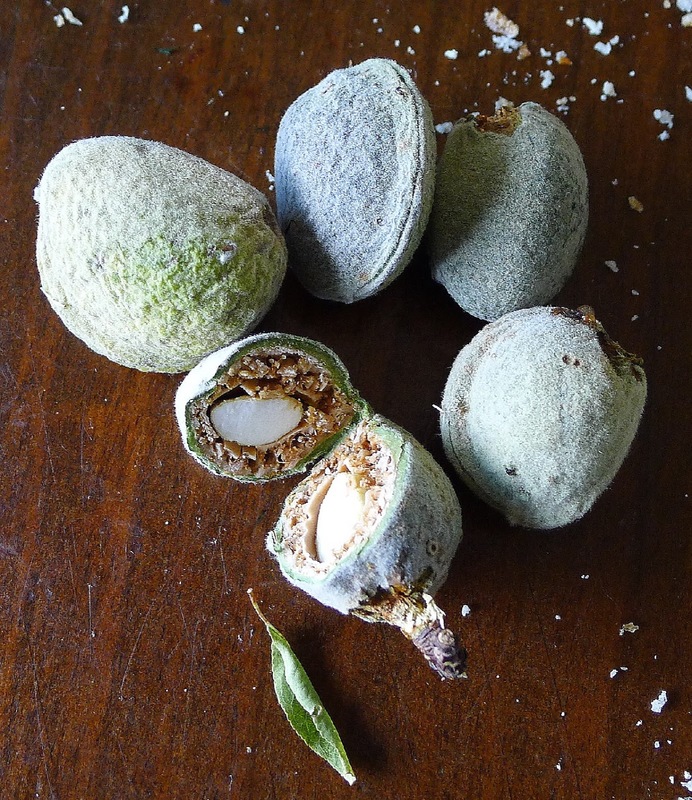 Earlier in the spring the whole almond is edible--outer pod, immature shell and gelatinous kernel. I used a handful of the kernels with regular shelled almonds to make the mazamorra. 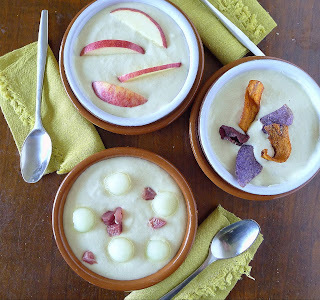 White Gazpacho (Ajo Blanco con Uvas). Grilled Chicken with Figs and Ajo Blanco Sauce. Ajo Blanco for Michelle Obama. Gazpacho Cream with Mango (Porra). 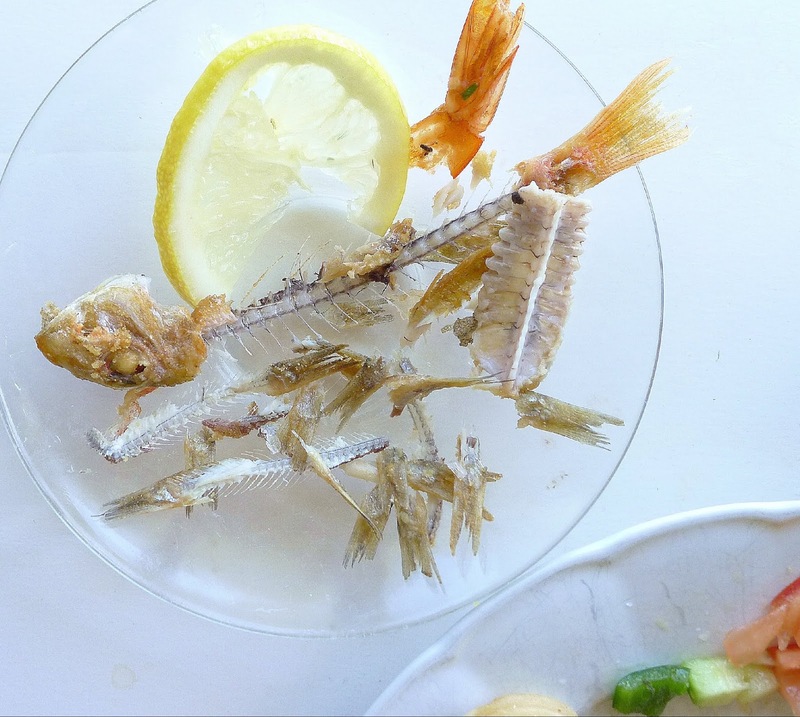 To eat fried fish at a chiringuito, a beach-side restaurant, on Málaga’s Mediterranean coast is to experience a profound sense of place. Here, close enough to the sea to get your toes wet, where the fishing boats are pulled up on the sand, the fish are fresh. Where olive groves still cover the hills (admittedly, fewer, as resort developments have sprung up), olive oil is on its home turf. This is fried fish at its best. 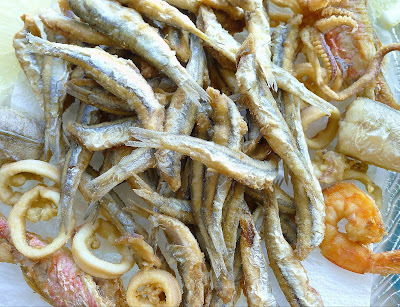 Pescaíto frito, Málaga style mixed fish fry. The fish used for a mixed fish fry are small ones--four-inch fresh anchovies; sole that measure only six inches; baby hake, called pescadilla; tiny red mullet, arguably the tastiest of Mediterranean fish; rings of squid. 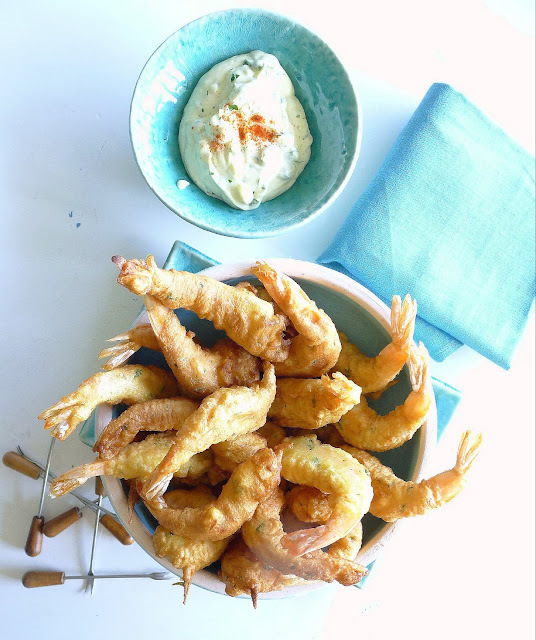 All are dusted with flour, fried golden in bubbling olive oil and served piping hot, heaped on a platter with nothing more elaborate than lemon to accompany them.
. Some of the fish typical of a Málaga fish fry, clockwise from the left are pieces of pescadilla (small hake), salmonetes (red mullet), calamares (rings of squid), langostinos (large shrimp) and boquerones (fresh anchovies). Pictured are fish to serve two. 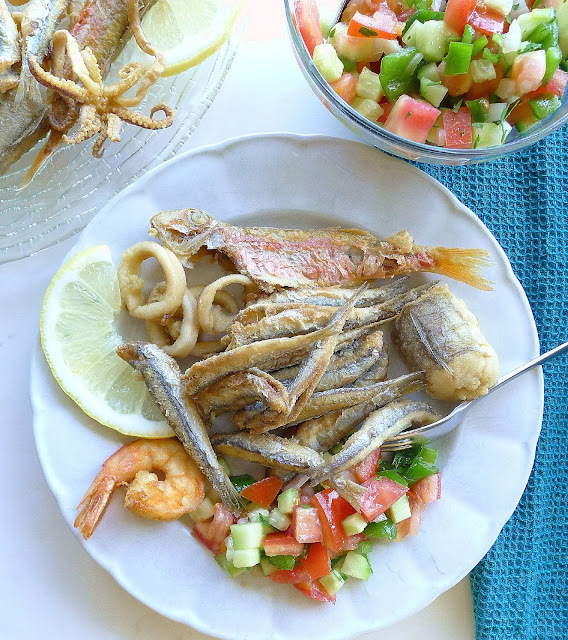 How to translate this Mediterranean fish fry to other shores?. You will need three or four different whole small fish. 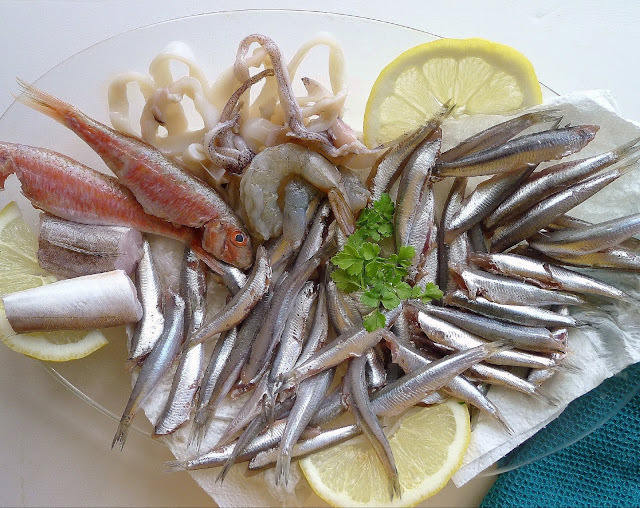 Some fish I found in American markets that could be used include small flounder, sand dab, Boston whiting (very much like pescadilla), herring, tiny mackerel, smelt, butterstar, small white snapper. Fish on the bone hold together better than fillets, though certainly fillets or crosswise slices of fish could be substituted for whole ones. Fish should be gutted and the heads removed. Sole or flounder are usually skinned. Slice any fish that are more than 8 inches long into 2-inch segments. Squid should be cleaned and cut in rings. After cleaning, leave the fish in a colander so it doesn’t sit in leaked liquid. Use a sieve to shake off excess flour. Have a large bowl or tray of flour ready. 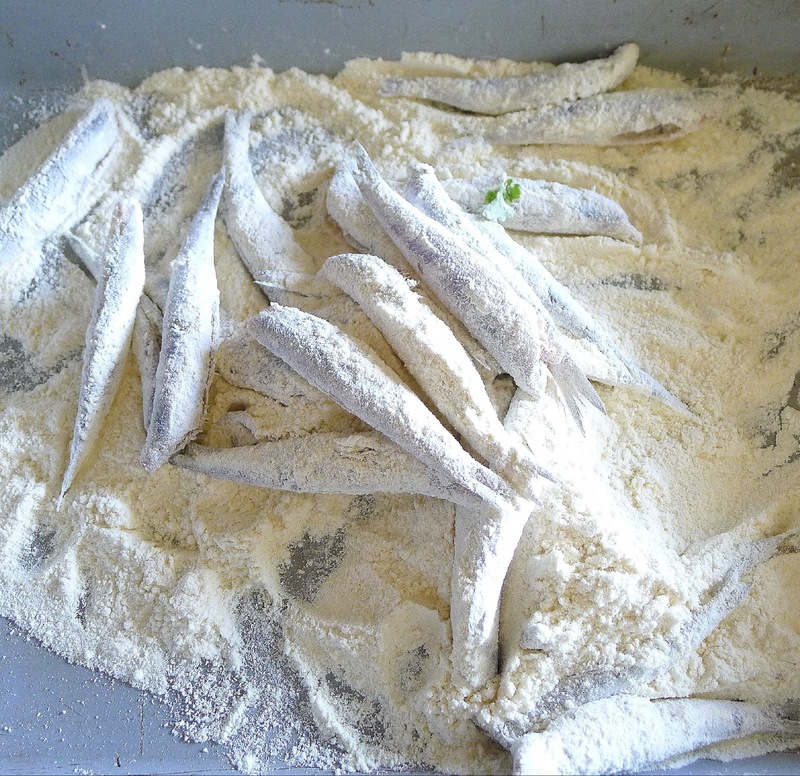 Dredge several small fish or a handful of squid rings in flour, then transfer them to a sieve and shake off excess flour. Spanish cooks use a flat-bottomed coarse sieve with a wooden frame. Removing excess flour prevents it from falling to the bottom of the pan and burning. The oil is important. Olive oil is best and traditional. It’s why fried fish is so popular in Andalusia. 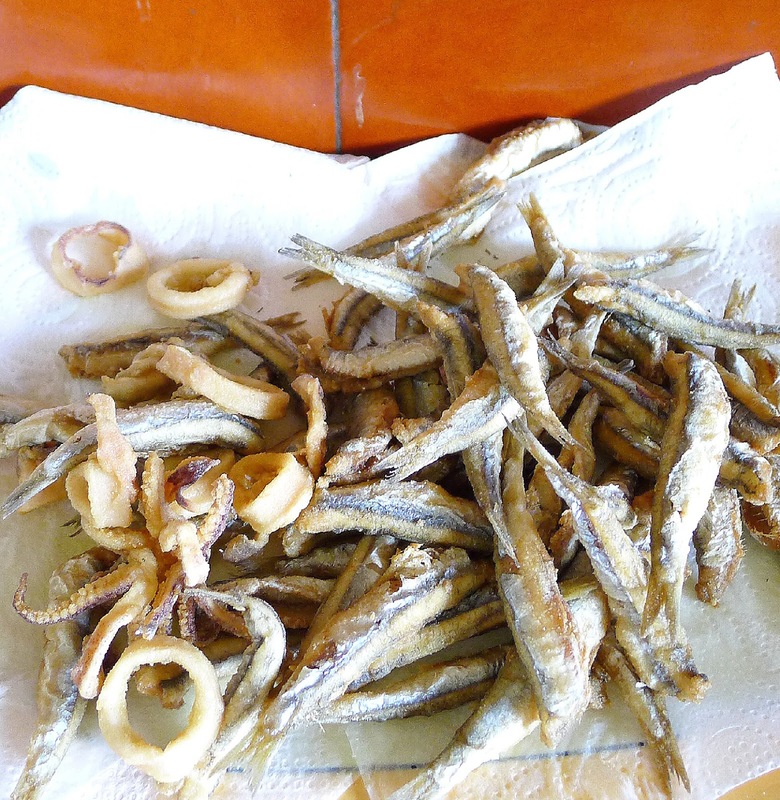 But, truth be told, most of those chiringuitos and fry shops don’t use real olive oil, because it’s expensive. Cheaper vegetable oils such as sunflower are used instead. But, if you use extra virgin olive oil, the results will be astonishingly good. Forget any old wives’ tales about olive oil and low smoking point. Olive oil is very stable at high temperatures. Foods absorb less of the oil in frying compared to those fried in other oils. In any case, you don't need to heat it beyond 360ºF. 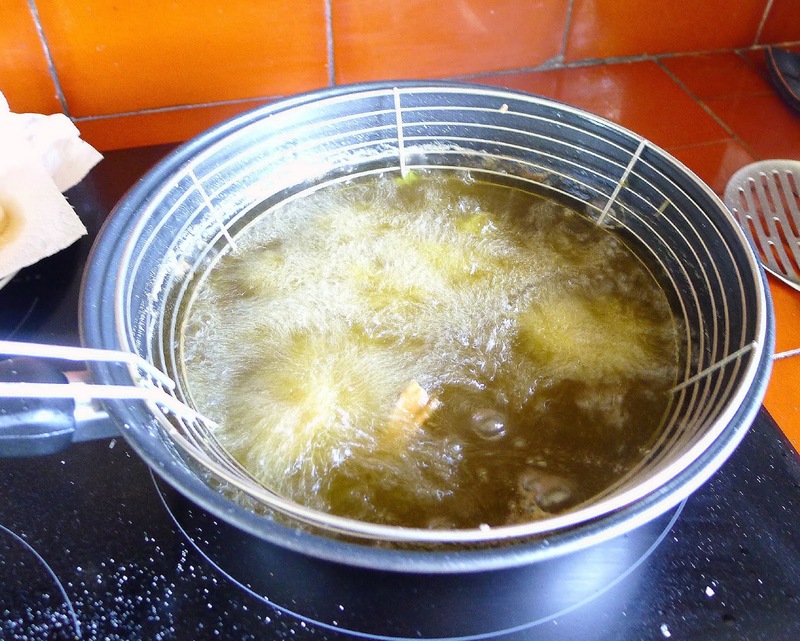 Fish frying in bubbling olive oil. 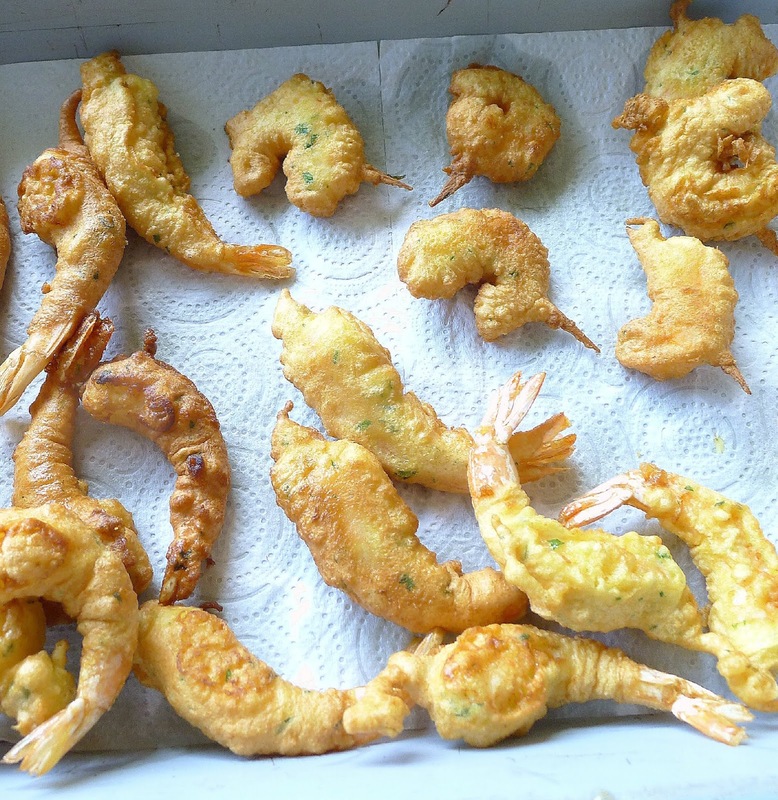 A deep-fryer is handy because it allows you to fry a larger quantity of fish at one time than you can in a frying pan. 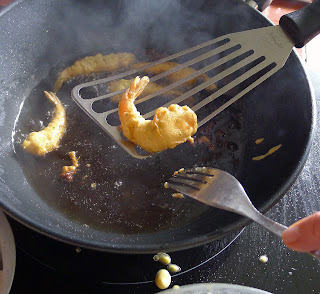 The frying basket makes it easy to submerge the fish and then remove it. Plus, electric fryers have thermostatic controls so you can regulate the temperature. However, you can prepare great fried fish without any special equipment. You will need a deep skillet or heavy sauté pan with sloping sides. A flat-bottomed wok would work too. The oil needs to be only deep enough to completely cover the largest pieces of fish. In the case of this fish fry, a depth of 1 ½ inches is probably sufficient. Depending on the size of the frying pan, you will need 4-6 cups of oil. Don’t fill the pan more than one-third full. Use a deep-frying thermometer if you have one. Heat olive oil to 350-360º. At this temperature, it takes a cube of bread about 25 seconds to brown. Olive oil is not heated to temperatures as high as other cooking oils (usually 375º). For this reason, combining two kinds of oil is not recommended. The coating of flour on the fish immediately forms a crust, so the oil doesn’t penetrate. The food will fry to a nice gold, not dark brown. 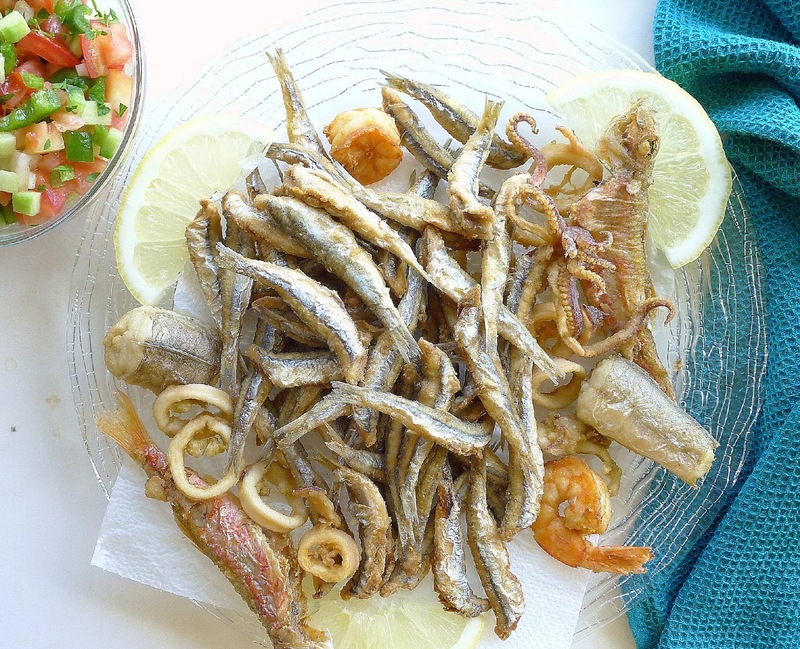 Fry each type or size of fish separately. Fry the larger and thicker ones first. 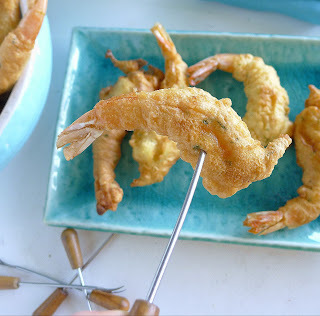 Use a long-handled skimmer or spatula to carefully place the floured fish in the hot oil. Add fish in one layer, without crowding. 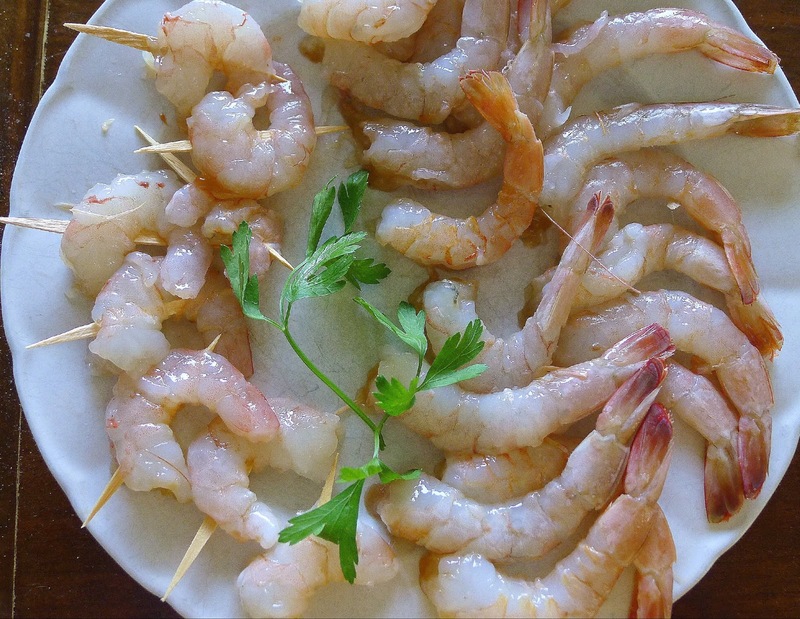 Sometimes moisture escapes from the fish and causes the oil to splutter, so stand well back. Drain fish briefly on paper toweling to absorb excess oil. Let the fish fry until golden. Timing is everything and this takes experience. Small pieces of fish will be cooked in the time it take them to turn golden, 2-4 minutes. Use the skimmer to remove the fish. Place it on a tray lined with paper towels. Salt it lightly. 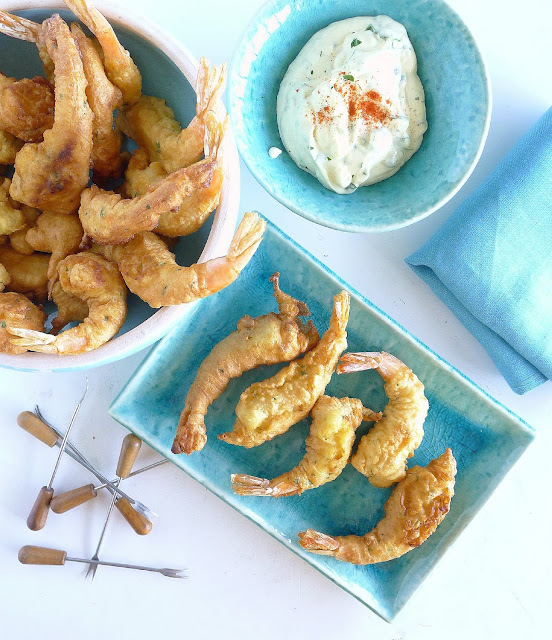 When all the fish is fried, serve immediately. The oil can be cooled, strained and stored in a dark place to be used one or two more times. 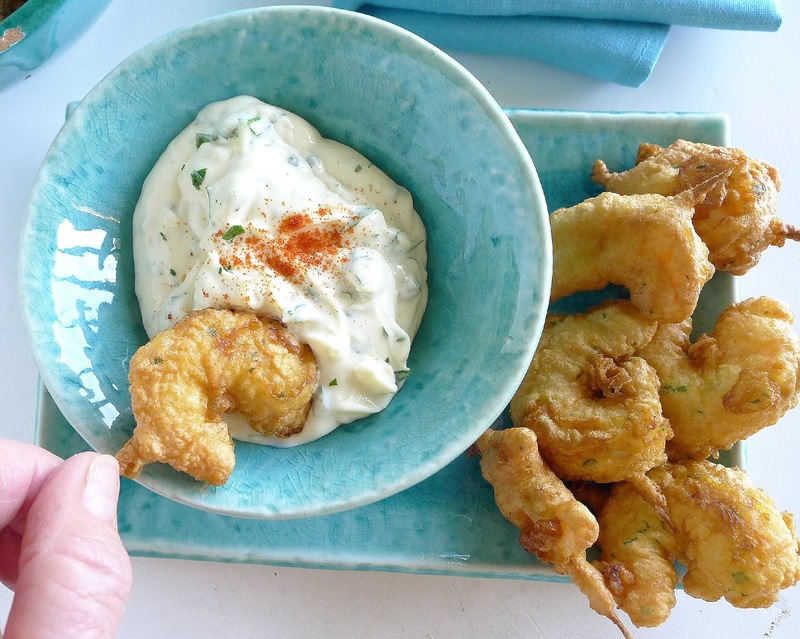 Serve the mixed fish fry with any fresh salad—greens, roasted red peppers, a chopped salad such as pipirrana or tangy gazpacho. 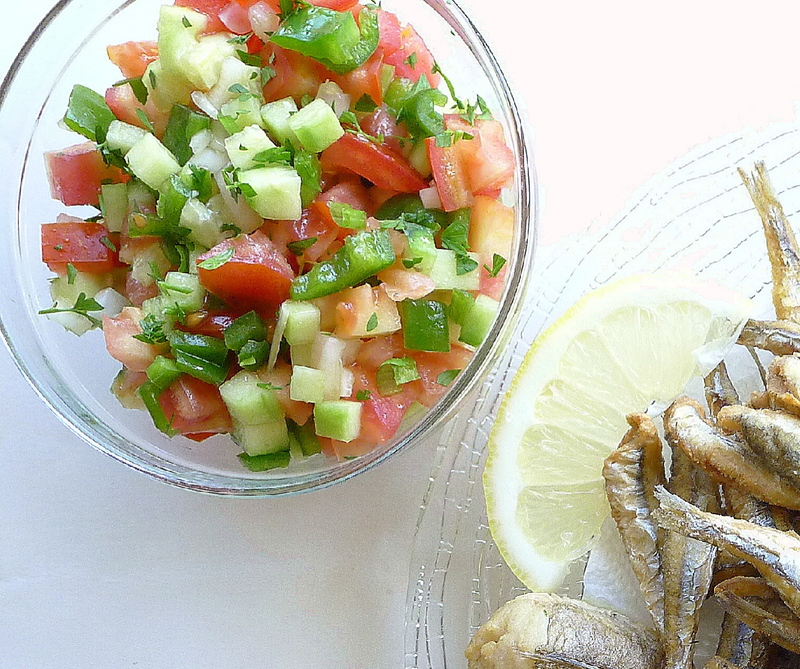 Traditionally, the fried fish is accompanied by only lemon. No sauce is needed. 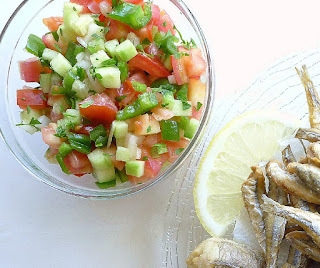 Fresh salad is the best side with fried fish. This is pipirrana (link to the recipe is below). 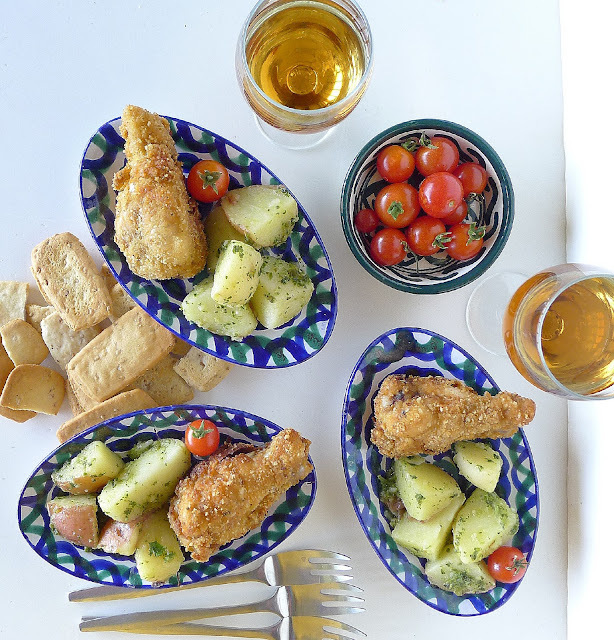 Fish fried in olive oil is golden and crisp. In Spain you can buy special flour for frying, harina para freir. Some brands are just coarse wheat flour. Others are a combination of wheat flour and chickpea flour or wheat flour, cornstarch and cornmeal. Some cooks like to add fine bread crumbs or fine semolina to the flour to give the coating a little extra crunch. But plain, all-purpose flour is fine. Pour oil to a depth of 1 ½ inches in a deep skillet. Heat it to 360ºF. 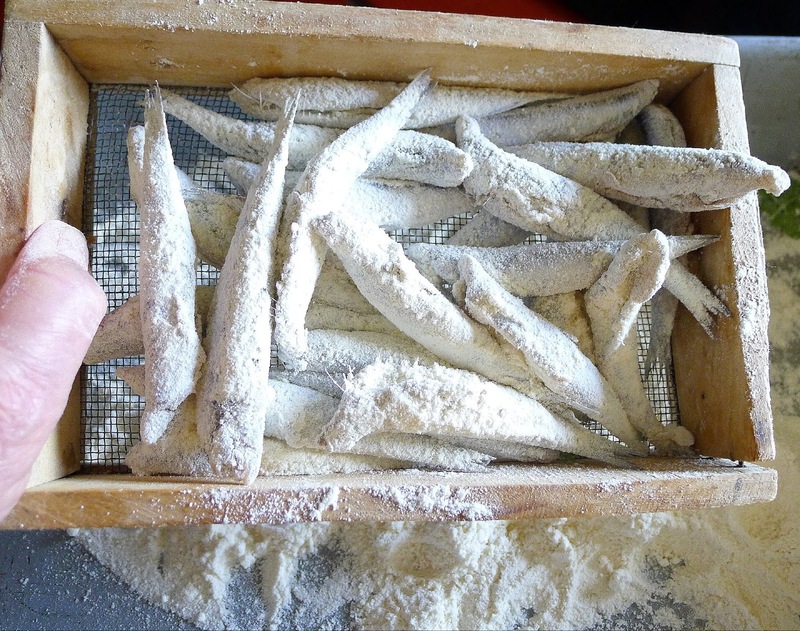 Dredge fish in flour, shake off excess and fry in hot oil, a few pieces at a time, until they are golden. Remove and drain on paper towels. Sprinkle with salt. Serve the fish hot with lemon wedges. Provide plates for bones and tails. Fried fresh anchovies can be eaten, bones and all, discarding only the tail. Fresh Tomato and Pepper Salad (Pipirrana). Fresh Anchovies Marinated in Vinegar. 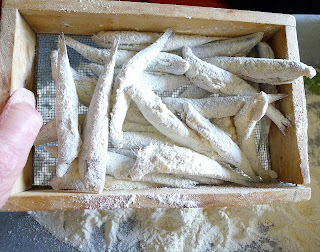 Field "Anchovies" and "Land Fish."